The author right with the first Sams Pizza pie of 2018 in February. His daughter, Remi, is behind the plate. Shes 13. Back when I was a younger man, leaner in the gut and less gray in the beard, an existential pizza crisis pulled me in different directions on the Wildwood boardwalk. The two metaphorical seagulls that live inside every man were fighting over my soul, or, I guess, my stomach. One seagull wanted Mack's Pizza, the pie it's always known, the pie my parents fed me each summer on every trip to the boardwalk back when I couldn't think for myself, when my complaints went ignored and I had no wallet of my own. An early ’90s photo of the author’s son, Ronan (front), and daughter Zenon, delighting in Sam’s slices. But the other seagull wanted something different, a slightly sweet slice with a floury, ever-so-burnt crust. In fact, it wanted anywhere from three to four slices, plus a fountain soda with better ice than Antarctica. My mouth just watered writing those sentences about Sam's Pizza Palace, the only pizza anyone should ever eat, at least when in the Wildwoods. No, wait, make that Cape May County. "The sauce. It's so sweet," my 11-year-old son texted me recently when I asked him why Sam's is the greatest pizza in the world. Needless to say, I chose Sam's Pizza that night and indoctrinated my children. That seagull is well-fed. The other starved and died. I haven't had a slice from that other place in over a decade. "It's good. You like it," Sam Spera, the 87-year-old founder and patron saint of Sam's, told me recently at the shop. Don't let that quote pass you by like a Jersey Shore banner plane. I met the Sam, the man my kids and I would only gawk at from a distance, dressed neatly in khakis and a cardigan with a newsboy cap, even in August. My older son has a T-shirt with Sam's face on it. I bought it for him. Spera's a man of few words, but he comes into the palace at 26th and the Boardwalk each day before noon to gaze upon the empire he started in 1957. He eats three slices with a cup of black coffee from Wawa. In the winter, the family makes him pies at home. Founder Sam Spera, 87, likes to have two or three slices of pizza every day at his place, Sam’s Pizza Palace, on the boardwalk in Wildwood. Not only did I meet Sam, I met the whole crew, people I've stared at from the counter for years while I gobbled down a "pep and plain" (maybe a sausage and soda refill, too, for the road). I met Sam's son, Tony Spera, the burly guy with the tattoos who spreads the sauce and cheese on seemingly every pie. Tony knows many families are either/or when it comes to Sam's and Mack's, but for him, there's plenty of pizza to go around for both businesses. "They're down there, they do what they do and put out a good product," he said. "We didn't start this pizza-wars thing." I asked Tony, 62, if there was extra sugar in their sauce. "Eh, not much," he said, ladling the sauce in circles over some dough. "It's just very good sauce from great tomatoes." Sam's son-in-law, Anthony Zuccarello, is the guy who sold me hundreds of slices at the old, wooden cash register at the takeout counter. He offered me possibly the greatest compliment I've ever received. "I've seen you here before," he said. Anthony Zuccarello, son-in-law of founder Sam Spera, slices pies at Sam’s Pizza Palace. For a shoobie — I hate that word — that's a high honor. When I'm down for a weekend at my parents' place in North Wildwood, I try to visit Sam's at least four or five times. I ate 13 slices on Easter weekend one year and in February, when I drove down with my girlfriend and two of my kids for Sam's opening weekend, I ate about six and may have developed a slight case of diverticulitis. "It's pretty good," my girlfriend said one recent morning. "I respect how obsessed you are with it." I liked one of those answers. This summer, my goal is to eat an entire pie in one sitting. One employee told me he ate 32 pies over the course of a summer working there, slice by slice. I was jealous. A group of high school girls just off the beach have pizza for lunch. My parents come to Sam's with me and my kids, begrudgingly. They make their preferences known. "Do you order sausage sandwiches at Sam's just to tick me off?" I asked my dad recently. "No," he said. "I think their pizza is boring." 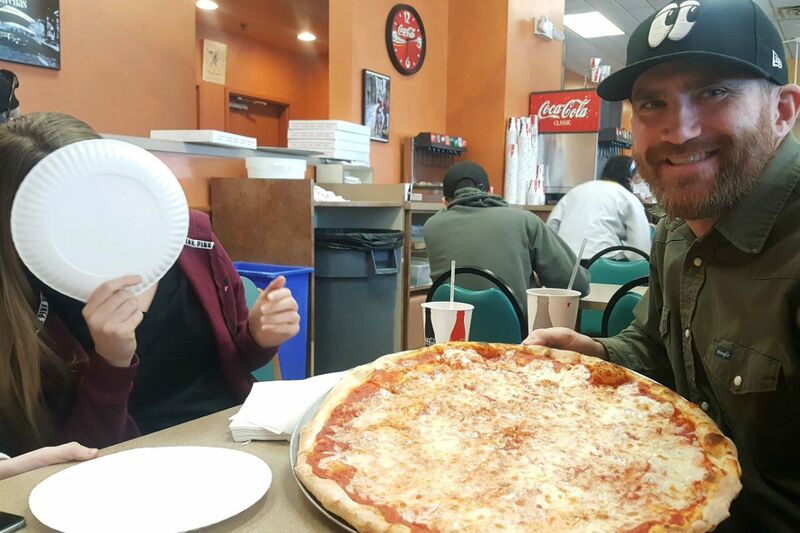 The authors mother, Nancy Nark, smiles in glee at Macks Pizza in 2014 while his son, Ronan Nark, looks on disgust. The guy pointing his finger, Mark Saylor, is a relative through marriage. My parents have even sabotaged me. One night in 2014, as I went to a wedding, they were babysitting my kids and took them to Mack's. My dad sent pictures to rub it in. Lately, my trips to Sam's have been bittersweet, despite the perfect sauce. They are markers of time, sudden growth spurts and puberty, the painful transition from a party of five to a party of four. I don't have to cut up anyone's pizza. I've tried to urge my kids to be their own person, to be unique and independent, knowing full well that seed may be thorny when it grows. I fear my children may someday abandon the palace the way I rebelled against Mack's, and I'm sure that fear goes deeper than just pizza dough in me. It's an age-old story, the tiny fractures that make families across the world all the more interesting, whether it's about religion, a sports team, or a delicious pizza pie on the boardwalk vs. one that's mediocre. My older son went to see both Iron Maiden and Black Sabbath with me once, but now he's 17 and like Lil Uzi Vert, he does what he wants. He still likes Sam's, I think. My daughter, 13, is still a Sam's fan, too, as long as I'm not trying to interact with her in any way. My younger son, quite possibly the most hardheaded in the family, is still devoted. He loves the chopped ice, but he's also going to middle school this year. Nowadays, I often wind up alone in Sam's as they scramble out to meet friends on the boardwalk or go over to the arcade to spend all their money. It's a little sad, yes, but I get to eat their crust and that's not so bad.